It's 5:30 PM on a Sunday. There's a knock at the door. It's Wayne Bayliss and Jill Cleaver from 28 Below Wine Imports from Australia. They've come bearing samples of Torrent Bay Wines from New Zealand- a Sauvignon Blanc and a Chardonnay. Hand delivery: That's one way to get around the restrictive shipping laws in Massachusetts. 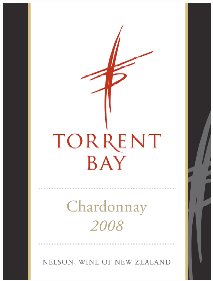 Torrent Bay Wines is named after a body of water in Abel Tasman National Park in New Zealand. They haven't been around too incredibly long- their first grapes were planted in the Moutere Hills of Nelson, New Zealand in the year 2000. Stylistically, the winery positions itself in contrast to many of the mass produced, mass marketed wines that we see on shelves in the U.S. Pretty full bodied for a Chardonnay. If this were milk, it would be about 2% in terms of weight. It seemed fairly heavily oaked. A little quirky on the palate- can't quite put my finger on it. It's not a straightforward wine. Not my favorite, but hey I don't like many Chardonnays and the ones I do like aren't that critically acclaimed. In my experience, Sauvignon Blanc is what New Zealand does best. I thought this was a classic New Zealand Sauvignon Blanc, if little bit less robust than my benchmark Kim Crawford Sauvignon Blanc. A clean and lively citrus/grass nose. Nice minerality on the finish. Smooth. Delicious. Check here for a list of their distributors in the United States. I'd like to thank Wayne and Jill for giving me the chance to taste these wines.